Some shows you go in knowing how they will end before they even begin. Take the Woody Guthrie Centennial Concert. You know that was going to end with the various performers coming out and leading the audience in a rendition of “This Land Is Your Land.” Even though the finale was a foregone conclusion, it still wound up being a very moving moment (more on that later) and the show that preceded it was far from a predictable concert experience. One of the reoccurring themes of the concert was the timeless quality of Guthrie’s music – how the mighty continue to abuse their authority and the powerless often still are oppressed. Joe Henry, in his short set of New York City-set songs, commented that Guthrie’s songs “comforted the afflicted and afflicted the comfortable” before launching into the “Jesus Christ,” a parable whose influence on Bob Dylan could be easily seen. The young Southern California country-rock Dawes plugged in for lively renditions of “Hard Travelin’” and “Dust Bowl Refugee.” On the latter tune, they were joined by Jackson Browne, for whom they have served as his backing band. After stating how Guthrie has “an impact still on music today,” the band performed their sociologically-charged original “A Little Bit Of Everything” that illustrated their point. Ex-X man John Doe ambled on stage to do “some dust bowl stuff.” He started with a slow, bluesy take on “Vigilante Man” and then singer Cindy Wasserman joined Doe and guitarist Val McCallum for hot hootenanny renditions of “Do Re Me” and “So Long It’s Been Good To Know You,” which made them seem like an alternative world version of Peter, Paul and Mary. Van Dyke Parks appeared next, sitting at the piano and putting his signature artful twist to “Pastures of Plenty” (a song he said he learned in 1962) with the nimble help of bassist Rob Wasserman and drummer Don Heffington. Former Rage Against The Machine guitarist Tom Morello played “Tom Joad” alone on his acoustic guitar before bringing out his band, the Freedom Fighter Orchestra, for an electric version of Bruce Springsteen’s “Ghost of Tom Joad.” Their powerful performance, fueled by Morello’s fiery guitar solo, led to the night’s first standing ovation. Morello then had many of the preceding acts come out to be his “choir of angels” for “Ease My Revolutionary Mind,” a Guthrie lyric he turned into a song for the Note Of Hope project. This political love ballad, which sounded like Leonard Cohen on a punk rock bender, closed to the first half of the concert in rousing fashion. One of the cool things about this concert what the collaborative nature of the performances – how the musicians (like Jackson Browne and Graham Nash) sang with other acts. Nash, in fact, wound up doing only one song on his own undoubtedly because his musical partner David Crosby was sidelined by an illness (his absence was mentioned only on flyers by the box office, not from the stage). However, Nash’s one contribution was a memorable one – a recently written original that railed against the U.S. government’s treatment of arrested American solider Bradley Manning. It was one of the many political references (many of them touching on the Occupy movement) that occurred during the night. Jackson Browne started his set with a song that more personal than political. “You Know The Night,” another song from the Note Of Hope compilation, was based on a poetic letter Guthrie wrote this second wife Marjorie. While a bit rambling, it fit nicely into Browne’s style and he was nicely aided by the backing voices of Sarah Lee Guthrie and Johnny Irion. Browne then brought out guitarist Blake Mills and Val McCallum to ignite “Which Side Are You On,” into an Occupy-era rallying cry rocker. That song’s standing ovation carried over to the arrival of Ramblin’ Jack Elliott to the stage. The Guthrie protégé, resplendent in a bright red cowboy shirt, was as feisty as ever as he requested that the distracting teleprompter be turned out, saying “I’ve been singing this song for 60 years.” The octogenarian’s voice held up well as he performed “1913 Massacre” and “Pretty Boy Floyd.” Both of the songs showcased Guthrie’s genius for injecting a common story (a family Christmas or an outlaw tale) with a political dimension that lifts it to another level without being heavy-handed about it. Sarah Lee Guthrie returned to the stage with Irion, who spoke how Guthrie wanted to be remembered “as the guy who told you what you already knew.” Irion lent his Neil Young-voice to “Another Man’s Done Gone,” a Wilco Mermaid Avenue number. While Nash, Raphael and Browne joined them for the self-described “risqué” tune “There’ll Be No Church Tonight,” Woody’s daughter Nora (one of the show’s organizers) danced on the side of the stage with Morello. 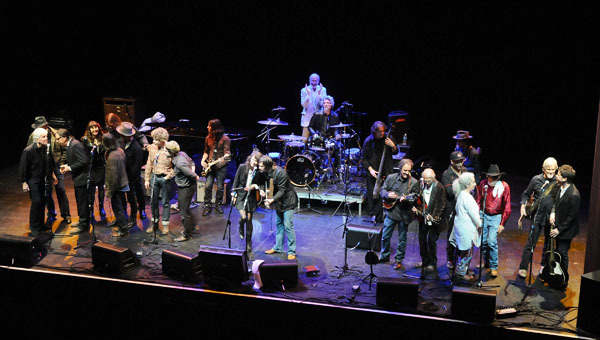 All the performers assembled on stage for “Bound For Glory,” which lead into “This Land Is Your Land.” Sarah Lee, appropriately enough, lead off the song, with Jackson Browne, Joe Henry, Van Dyke Parks and Kris Kristofferson all taking turns with the verses on this uplifting, extended version. You could see the joy on Kristofferson’s face during this performance. Tom Morello took the microphone and took charge of wrapping up the song and show. Demanding that the house light be turned up, he got the whole crowd to sing along on this “alternative national anthem.” Morello was like an agitprop ringmaster as he exhorting that “the wheels of history in (our) hands,” as the show came to a rousing conclusion. Beyond being a glorious celebration of the 100th anniversary of Woody Guthrie’s birth, the concert had several other consequences. It served as a reminder of how relevant Guthrie’s music remains today. The social injustices that he spoke out again then still ring true today. Moreover, the concert showed what a terrific job Nora Guthrie has down over the years in opening up the Guthrie archives and connecting musicians of today with Woody’s words, which all results in keeping his legacy very much alive 100 years after his birth and 45 years after his death.